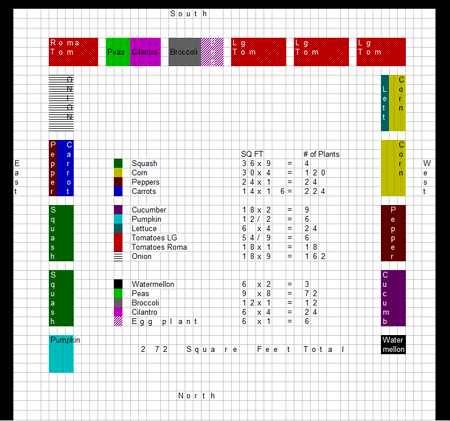 Sandra, one of my readers, sent me her tentative square foot garden plan for 2010. I appreciate her allowing me to post her layout and our comments back and forth! The first concern I had was the corn. In order to pollinate, it needs to be at least 3 rows deep. I would suggest planting it 3×10 instead of 1×30. Next is squash and pumpkins. I suggest keeping it all together and give it LOTS of room. It tends to overtake everything at some point. You can consider planting it next to early spring veggies (like broccoli, cauliflower, garlic, or peas). Squash is planted late, and by the time it gets big you will have harvested the others. Also, squash will grow particularly well near corn or onions. I have had limited success using a trellis with winter squash and pumpkins. They are so prickly and big! But I find watermelon much easier to trellis. I see this plan has 16 squares of lettuce (with 4 plants per square). That is A TON of lettuce! It grows quite quickly, so you could cut that space in half and still have plenty. For my family of 4 I grow about 4 squares at a time (that’s 16 plants), staggered. I plant each square every 2 weeks or so. That way I am harvesting 2 squares at a time. Garlic is planted in the fall and by spring it is tall and in the way. If you don’t have access to the garden on both sides it will make it hard to work with your broccoli and cilantro. Finally, do you have access to your peas from the back side of the garden? I might plant and support them the other direction. I did get a comment from someone else about the corn and have been thinking about redoing that. I was planning on planting the lettuce every couple of weeks, but I have to rethink that also, I remember how hot it got last summer and it did not do so well and would be growing to late in the season. I can access the peas from the back. I plan on leaving three feet between the fence and the garden for easy access. Last summer I used doors to make my boxes and left them at the six foot length so that the boxes were 6′ by 6′ and found that it was very difficult to get to anything in the middle. We rent our home so I don’t want to invest to much money so was thinking for this year to use cinder blocks which I could take with me when we move. So smart to go smaller–you could just cut some of your doors in half for the 3′ sections. Cinder blocks would work well, but they’ll be heavy to move. I’m sure whatever you use will work fine! I built a friend’s with wood and it turned out fantastic. You could still build your shape, but do it in sections that would be easier to move (3×6). You can see she added directions (North/South), which is helpful to consider. 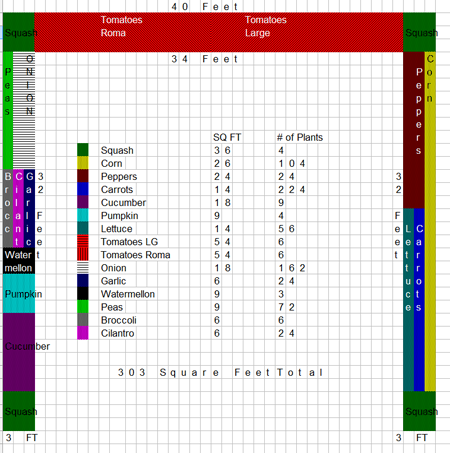 Also, it looks like she’s planning to have separate garden beds, each 3×6. Maybe she can recycle those old doors again! The lettuce is going to LOVE growing next to the corn, since it will get tons of sun all day long, but be shaded in the hot afternoon. This new garden plan looks great! Hopefully Sandra will send us some pictures mid-summer, so we can see how it looks with plants growing. Learn how to create your own square foot garden plan. Wow, such a great plan! I really like the layout and space she gave everything, this post really inspired me to get mine started next summer (I just have a sad little spot right now that I’m using). What color does Sandra garden from (I’m Blue, so I want to make sure we have similar locations before I borrow some of her ideas, hehe!). Thank you for such a great blog, Emily – it really is such a terrific resource! If you are doing traditional gardening, it may not matter so much where you put the trellises because the plants are given a lot of space due to the rows. But when you remove the rows and grow intensively, tall plants will shade short ones, which could delay their growth. It’s recommended to put them on the north side, because the shade will fall to the north and won’t land on any other plants. If you WANT shade (for cool weather plants), plant them on the south! For companion planting suggestions, follow the link. I’ve done row gardening for several years with mixed result. Most of what I grow require cageing or trellising and I wonered if the trellis is always on the noth side of your garden? I’m also thinking of making two foot wide bed for tomatoes and a three foot wide for the squash. In Md we have really hot summers so lettuce, spinich, and radishes are what we call cool weather crops and I would like any suggestions for follow on/companion plantings with them. My husband built our8 8′ x 4′ vinyl garden boxes with vinyl from Home Depot. He just bought the square garden posts that you use for the fencing and cut 2 holes on 2 of the sides, then he slid the rails in. We filled the corner posts with dirt to help weigh it down and keep the rails from moving. We also have to posts 1/2 thru our long 8′ sides for extra support. We capped them with the decorative tops. We get compliments all the time. I just found your website and I am amazed at all the information you have provided. You really got me excited to be growing a garden again. I was just wondering if you could provide specifics about your vinyl boxes. I’ve looked at the vinly fencing at the Home Depot website and I can’t find a post that would allow 2 cross planks right next to each other. Can you give me any more information about how you built your boxes? I’ve had success with trelissing pumpkins & squash by using cattle fencing & fence posts. I put it at the side & would allow it to arc half way over the top of the walk where another one was coming up from the bed beside it. It made a lovely tunnel & always made me giggle to see them dangling. They were also perfectly round & beautiful those dangly ones. Be sure to check the top sides weekly. If you’re not careful those that rest against the wire can grow through the wire, be damaged by the wire or simply become gross. So check the tops & the arc & move them through so they’ll fall through the squares. Watermelon, tomatoes, cucs, etc can be hung this way too. WOW, great tips, I have heard that you can plant your pumpkins with your corn. We can plant earlier here so I am trying that this year, by the time the corn is done the pumpkins ought to be taking over and I can just pull up the stalks. My corn/pumpkin experiment will be in 4’x8′ boxes and I had a friend tell me she snipped the end of her pumpkin vines to stop them from getting longer and she yielded more pumpkins this way.